Photo courtesy of Craig Monzyk. UNION, Mo. 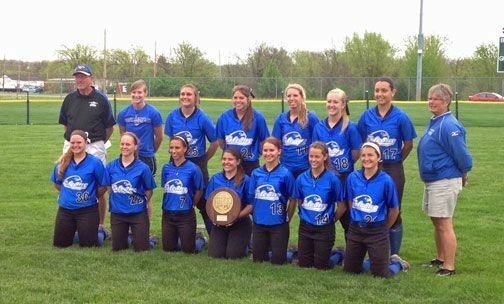 - The East Central College women’s softball team (30-20) claimed their third consecutive NJCAA Division II Region 16 championship Saturday afternoon with a 7-2 victory over Mineral Area College. The top seeded Lady Falcons won three straight to claim the reginal title, advancing Coach Brad Wallach’s Lady Falcons to the District J playoffs. They opened the tournament Friday with a 14-3 win over Cottey College followed with a 6-1 victory over St. Louis Community College. ECC will host the Lady Aggies of Murray State College from Tishamingo, Ok. The best of three district series starts Friday, May 2, at the ECC softball field. Game times are set for 2 p.m. and 4 p.m. If the two teams would split games on Friday a final and decisive third game would be played at noon Saturday, May 3. The district winner earns a spot in the National Junior College Athletic Association Division II Tournament May 14-17 in Jackson, Mississippi. The Lady Falcon’s last trip to the national tournament was in 2012 when they came away with a thirteenth place finish.